Well, it’s happened again. Veganuary has had another record breaking year with over 300,000 people eschewing meat, dairy and animal products for the month. The reasons behind this are as unique and varied as the individuals themselves. Some will be hoping that switching to a wholefoods plant based diet will help them to meet their weight loss goals. Others will be inveterate animal lovers who can no longer reconcile their love of all things four legged and furry with the inherent cruelty of animal agriculture. Some will be eco-conscious consumers who have learned that animal agriculture is one of the world’s leading causes of deforestation, ocean “dead zones” and wildlife habitat loss and that going vegan is one of the most environmentally friendly things you can do for the planet. Or there will be some who are merely curious. They may be consummate foodies who are looking for an opportunity to try new veggies, fruits, grains and pulses that they’ve seen in recipe books yet never quite had the inclination to try until now. Some will stick with it for life. Others will go back to eating meat, fish, eggs and dairy products as normal. Some will take a little more time to find more ethical and sustainable animal foods. Every little helps to ease the burden of animal agriculture on the planet. While more and more humans are flirting with the prospect of going vegan there are an increasing number of new and veteran vegans who are also getting their pets in on the act. Vegan dog food is a growth industry which recently passed the 3.1 billion dollar mark. However, the notion of vegan dogs is not without controversy. Some argue that it’s unnatural for dogs to live on a plant based diet and that owners who implement them endanger their pets’ health. Here we’ll take a fair and even handed look at the arguments made against canine veganism and look at some of the benefits and potential risks in raising your four legged friends on a plant based diet. Is it unnatural for dogs to go vegan? When you take a dog into your home, it’s not a decision that you have made lightly. You understand that you have a responsibility to keep your four legged friend safe, happy and healthy. Thus, even if you live on a plant based diet yourself, you may think twice about feeding your pet the same. A common argument against veganism in dogs is that it goes against the natural order of things. Dogs are natural omnivores. Like their cousins the wolf, the dingo and the jackal they are great scavengers and have evolved to live comfortably off of whatever food they can get access to (much like us). Unlike wolves, however, dogs are not instinctive hunters. They are domesticated and lack the skills and instincts necessary to take their place in the food chain. Thus, when people talk about what dogs would eat “in the wild” it’s kind of a moot point as dogs have been maladjusted to live in the wild for several millennia. Thus, while many dog owners default to a diet containing mostly or entirely meat based foods that is not to say that it is the best suited for their nutritional requirements. A dog’s pancreas is highly evolved and more than able to break down plant based foods to extract the nutrients from them. Yes, dogs share most of their mitochondrial DNA with wolves. Yes, wolves are largely carnivorous. But as this helpful article points out one of the major evolutionary difference between dogs and wolves is that dogs have evolved with a better ability to digest starches than their wild ancestors. Moreover, unlike wolves, dogs have the ability to synthesize vitamin a from the beta carotene found in plants meaning that they do not need to find it in animal sources. People may talk about it being “unnatural” when pet owners abstain from meat on their dogs’ behalf… But at the same time there’s nothing natural about what goes into many commercially available meat based dog foods. The standard of meat in many canned dog food brands (especially cheaper brands) is often meat not deemed worthy for human consumption and comes from the four Ds of the meat industry; that is to say, the flesh of animals who are Dead, Dying, Diseased or Disabled. Processed meats such as ham, salami and pepperoni are classified by the World Health Organization as Type 1 carcinogens. That’s the same category as cigarettes. If these products are deemed safe for human consumption that doesn’t really speak to the quality of the meat found in commercially available dog foods. Pentobarbital- A sedative used to euthanize animals. Trace elements can be found in the flesh of animals who have been euthanized before being made into dog food. BHA / BHT- Preservatives found to cause kidney and liver trouble in humans and animals. Ethoxyquin– Another preservative that’s so damaging to the liver that it’s illegal in human food… But perfectly legal in animal foods. Artificial food dyes- Linked to kidney issues and intestinal tumors. Rendered fats- Can be a source of food borne illnesses like salmonella. As you can see, feeding your dog a wholefoods, plant based diet is infinitely preferable to feeding them canned foods which are rife with poor quality meat and terrifying additives. The fact is that dogs can lead a very long and healthy life on a plant based diet. Just ask the owners of Bramble, the 25 year old collie who got to such a ripe old age (the average life expectancy for a collie is 14 years) on a diet of lentils, vegetables, textured vegetable protein and organic brown rice. Not only can a vegan diet sustain a dog, it can allow them to thrive and ward away many of the diseases that are common in animals with high protein, high fat diets (including human beings) including mad cow disease / BSE(because there are no cows or cow derivatives), cancer (because a vegan diet does not have the carcinogenic compounds traditionally associated with processed meats), allergies and issues with the heart liver kidneys and bones. As always, when choosing a pet food brand it is important to consult with your vet to determine exactly what your dog’s nutritional needs are in order for you to plan a complete diet and any additional supplementation that they may need (more on that later). Your dog food is not the only opportunity you have to help your dog to thrive on a cruelty-free lifestyle. There are also a plethora of vegan and cruelty free treats and toys on the market without needing to resort to plastics. Many who favor natural treats for their dogs give them pigs ears, rawhide or animal bones. However, while your dog can get a lot of enjoyment out of these there are lots of cruelty free alternatives. Cereal based dog treats, toys and chews are a useful alternative that dogs will love. However, it’s important to always check the label as some predominantly cereal based treats may still contain animal derivatives. You could also consider antler dog chews. While these are derived from animals they are completely cruelty free as they are naturally shed by stags, locally sourced and full of vitamins and minerals. While most dogs are hearty eaters and way less finicky than their feline friends, you should still think twice about making your dog go cold turkey (or cold tofu). Be sure to gradually phase out meat and animal products from their diet as you phase in more plant based foods. 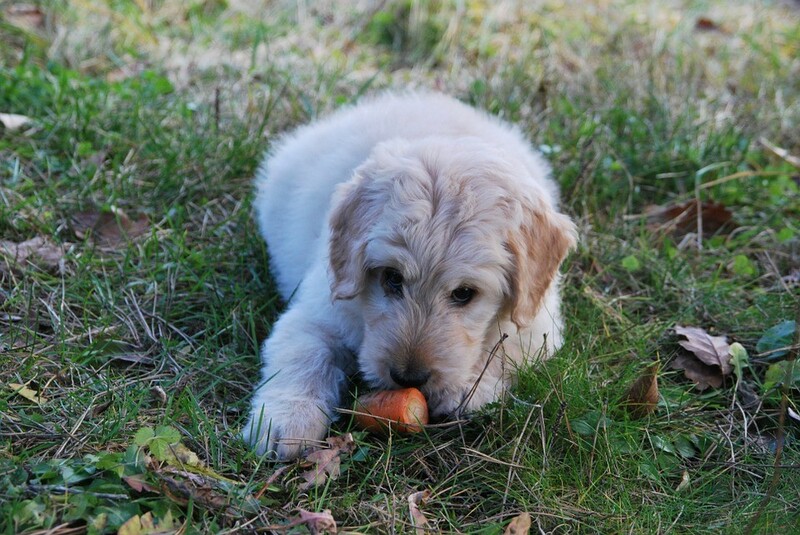 The key to a healthy diet for your canine companion (be it plant based or omnivorous) is that it is nutritionally complete. If you exclusively feed your dog homemade meals, it’s important to ensure that your homemade goodies are supplemented to ensure that they have everything your furry friend needs. You may want to give your dog supplemental amino acids like L-carnitine and taurine as well as calcium and vitamin D supplements. Once again, we recommend talking to your vet before making a diet plan for your dog. With proper care and attention, however, your dog can thrive on a wholly plant based diet!